When it comes to family dinners, we look for meals that are filling and delicious AND nutritious. Sometimes that can feel like a tall order, so we make sure to keep track of all the successful (and successfully received) meals that check off all the boxes on our list and that our family loves. This means lots of dishes that are packed with protein and veggies, but that our family might not realize is good for them…. One of our go-to dishes – we make it at least once a week, since it’s just that good – is chili and cornbread. Chili is one of those amazing meals that is deliciously comforting, easy to make, and packed with protein and fiber to fill you up. Cornbread is a must-have side dish with chili, which we typically make from scratch, but it can be a bit inconvenient to cook the two separately. After a long day, we don’t always feel up to whipping up a big batch of chili along with our homemade cornbread (and we don’t always like being stuck with all those dishes), so we decided to come up with a way to make this dinner a little easier. To streamline the process we baked our cornbread right on top of the chili! How easy is that? We use cornbread muffin mix in this recipe to really cut corners, but you’re more than welcome to make yours from scratch, if you’re so inclined. 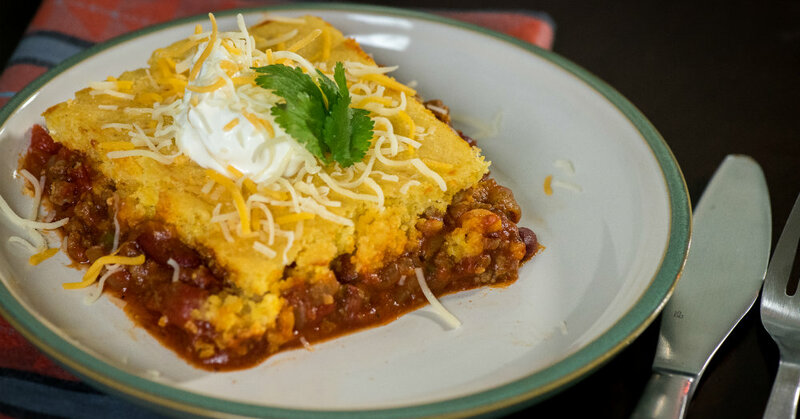 One of the many reasons we love making this casserole is because, while our cornbread normally crumbles and falls apart when we dip it in our chili, cooking it on top of the chili means we get the perfect ratio of cornbread to chili in every bite, without having to worry about crumbles! Our versatile chili cornbread casserole is perfect for weeknight dinners, family get-togethers, and next day leftovers – if it doesn’t get polished off once we put it on the table! In a large skillet over medium-high heat, brown beef, onion and jalapeño until beef is cooked through and veggies are softened. Drain fat and return to heat. Season with salt and pepper, then stir in cumin, chili powder, garlic powder, tomatoes, enchilada sauce and kidney beans. Cook for 7-10 minutes, or until mixture has reduced slightly, then transfer to baking dish and sprinkle 1 1/2 cups Mexican cheese blend over the top. In a large bowl, prepare corn muffin mix according to package directions (stirring in egg and 1/3 cup milk until smooth). Stir in remaining cheese and pour mixture evenly over beef and veggies. Place baking dish in oven and bake for 20-22 minutes, or until toothpick inserted in center of cornbread comes out mostly clean.